You learned it in Sunday School: “Jesus Loves Me, This I Know” ❤ Though many of us can quote the song lyrics and the John 3:16 (“for God so loved the world that He sent His Son….”) and we can give mental assent to the idea that God is love and He loves everyone, it’s difficult for some of us to really get this truth from our head to our hearts. I really think it would change everything to know that we know that we know that God loves us just the way we are. Let that sink in for a minute. Can you appreciate the distinction, the difference that changing those little letters makes? He knows that in His love, there is the possibility for better. He knows that in His love, you can be free. He knows that in His love, you can be completely satisfied. Your mistakes don’t hurt Him – your mistakes makes Him hurt FOR you, because He knows you don’t have to live like that. He knows that if you could get to that place – where we understand His love and enjoy all the benefits of His love – then you could honestly receive the love of Jesus in its full measure. You may think, “I’ve gone too far, I’ve been too wrong….” You may have even been told that you have broken the Father’s heart. None of that is true, my friend. His heart is not broken by you – His heart may be broken for you, but that is a different feeling. He has offered such a gift – He knows you don’t have to live bound by your sin. And it goes even further, really, if we let it: If we could take the example of Jesus and live without offense, we could recognize the hurts of people around us. We wouldn’t take everything as a personal attack, because it’s not all about us. We have to think of others, we have to prefer our brother, we shouldn’t think more highly of ourselves than we ought…. Maybe we could grow into recognizing that we don’t have to be hurt BY people, we could hurt FOR people, too. If we can get to that place – where we understand that the love of Jesus is without limit and we aren’t stuck in some kind of scarcity mentality and He has plenty for all of His children, than we can move into the place where His love can flow from us uninhibited, without reservation. Flowing from His heart to our heart to their hearts (the people within our sphere of influence), until they start to experience for themselves firsthand the love of Jesus – and then guess what? Uninhibited, the love flows from His heart to their hearts to the hearts of the people within their sphere of influence, and like ripples in a pond, they keep going out and out and out and on and on and on…. Jesus always pointed people forward to the Father, motivated by love, because He knew that’s where their healing and help would spring from. If we can get ahold of how much the Father loves us, how we could be healed in His love, wouldn’t we want to pass it along? Love people enough to lead them to God? Maybe it’s about living in such a way that people who don’t know God might come to God because they know you. Flowing from His heart to our heart to the hearts of the people within our sphere of influence, until they start to experience for themselves firsthand the love of Jesus – and then the love flows from His heart to their hearts to the hearts of the people within their sphere of influence, and the ripples keep going out and out and out and on and on and on…. The first piece of advice I received upon entering ministry was “you can’t trust anyone anymore – these people want to pick you for information, and when your husband makes them angry, they’ll use it and turn on your family.” Welcome to the ministry? I wasn’t the only who received this advice – a few years later, a friend became engaged to a pastor and she got the same speech. She sidled up next to me at the restaurant table that evening and said, “Missy, I already heard that I can’t have friends anymore. Well, guess what? You and me, we’re best friends now!” I was so grateful to her and I smile (and laugh) every time I think of that evening! I laugh when I think of that advice, too. It was well-intentioned, I have no doubt AT ALL – I have just found that it isn’t true. Not for me, anyway. “These people” are not these people – they are my people. Over the past 23+ years, “these people” have been my closest friends, and I have been blessed by letting them in. I like it like this, this living heart open. You have recorded each one in your book…. It doesn’t seem like those two go together here, but stick with me – they do! If your steps are ordered by the Lord, you are exactly where He would have you, and you are exactly with the people that He ordered alongside of you too – and it is delightful! If you are heart open or heart broken, God is collecting your tears, your sorrow is not for nothing. He has placed people around you (a dear one told me yesterday: “sometimes we need Jesus with skin on” and oh, wasn’t she just that to me? You know those times – God is on your side, but it’s nice to have one of His children alongside too). While we’re visiting and vulnerable, want to know something else? I try not to cry in front of my church, I don’t know why. But some days…. Well, some days I can’t help it (this wasn’t the first time, sorry!). You know what I do? It’s so silly. I take a deep breath and I greet everyone like usual: “How are you? Oh me? I’m so good too!” and smile and walk around as if nothing. Sometimes, not often but sometimes, I sit down and put my head on a dear prayer warrior’s shoulder and cry openly. I tell her: “I can’t talk about it, I have these people to protect, but will you pray for me?” and she does right that very moment and she reminds me of the faithfulness of God and my faith comes by hearing and hearing her voice (Romans 10:17) and I’m strengthened. I’m blessed. I have a handful of tissues or napkins on the front row. As I’m facing the people on the stage, I’m bawling my eyes out, sometimes shoulders shaking from the trying to stop it, sometimes closing my lips tight to try and hold in a sob. Sometimes the band notices me and sometimes they don’t. When Michael says, “turn and greet your neighbor”, I dry up and turn around and smile, as if no one in the sanctuary has seen me. I pretend no one saw me rush out to grab another handful of tissues because I used up the ones I had a few minutes ago. Sometimes no one did notice, thankfully. Sometimes I get a “you okay?” text from the back row, thankfully. Both are mercies. Sometimes they all noticed, and they all prayed. They remember when their heart was broken and I prayed for them. They aren’t just “these people”, they are my people and I love them. Many summers ago now, I visited a friend in my hometown. We snapped beans with her grandmother, on the front porch, in the afternoon sun, sitting on the wooden rockers or in the swing. Simple, we enjoyed and we chatted. A face-to-face about the green beans and the garden turned into a heart-to-heart about children and marriage and life and joy and sorrow – events that had made our year, growing us like the earth had grown these green beans. 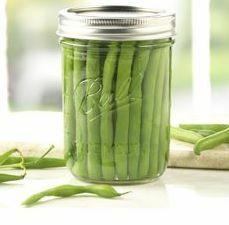 In a little while, we’d start the process of jarring the green beans, sealing them up to enjoy again on another day, in another season. A treasure chest in its simplest definition is anything that holds treasures, wouldn’t you say? If that is true, I have treasure chests all over my house, and I imagine you do too: frames holding baby pictures and senior pictures and family pictures – those are treasure chests. Shoeboxes with old birthday cards and souvenirs from trips – those are treasure chests too. The china cabinet in my dining room with my grandmother’s china displayed inside – I never looked at it and thought “that is a treasure chest”, but now that I look again, it surely is, holding treasures precious to me. The Lord has treasure chests too – all different shapes and sizes. Here’s one that makes my heart smile and brings a comforting quiet to my spirit every time I come across it: “your life is safe in the care of the Lord your God, secure in His treasure pouch!” (1 Samuel 25:29). His “treasure pouch”, and you know what’s inside? We are! Your life, safe in the care of the Lord. My life, safe in the care of the Lord. Every detail that pertains to life and godliness, safe in the care of the Lord. How about that? My mason jar/treasure chest could only save one day: our Father God’s pouch/treasure chest holds all of us, every day, every moment, big and small. In chapter 3, we see that all the people worked “except for their nobles, who wouldn’t work with their master and refused to get their hands dirty with such work” (Nehemiah‬ ‭3:5‬ ‭MSG).‬‬ It’s a blessing to have the strength to work, a blessing that God would allow people to cooperate with Him in restoration or whatever He needs accomplished. I don’t ever want to be so self-important that I “refuse such work”. If God is involved, I want to be involved! James 4:17 says, “to him who knows to do good and does not do it, to him it is sin” (NKJV). If you know what needs to be done, be thankful for the opportunity and get it done! In chapter 4, the people countered the opposition of their enemies with prayer. I love the response and when the enemy opposed the restoration. Look at this: “We countered with prayer to our God and set a round-the-clock guard against them” (Nehemiah 4:9‬ ‭MSG‬‬). Prayer is a weapon – don’t overlook it’s power. So many times, we get bogged down in our own hardships and forget that God is for us. Please don’t let this verse describe your situation: “You have not because you ask not” (James 4:2 NKJV). In chapter 5, the people refused to be distracted – even by their own needs. Look at this: “I had work to do; I worked on this wall. All my men were on the job to do the work. We didn’t have time to line our own pockets” (Nehemiah 5:16 MSG). They were too busy working for the Lord to be distracted by their own needs – that’s remarkable. They trusted God to take care of them as they obeyed what He had told them to do. AS you are faithful to God’s call in your life, he will be faithful. Remember Psalm 37:25? “I have been young, and now am old; Yet I have not seen the righteous forsaken, Nor his descendants begging bread” (Psalm 37:25 NKJV). Are there people around you who are refusing to do the work? Probably – sadly! Don’t be discouraged by the behavior of others. Do you have an enemy opposing you? Sure – but counter his attack with prayer and you WIN! Do you have needs, physical, emotional, financial, that might cause a distraction? Yeah, we all do – instead of focusing on what could stop the work, look UP from when comes your help – God will provide for you as you are faithful! Do you have people who want to distract you, get your focus off of what the Lord is asking of you? Yep, those too. Why should you come down to meet them on their level? YOU ARE DOING A GREAT WORK! Realizing that the Lord has a purpose for your life is a treasure ❤ I’m praying that you will grasp it with both hands and do all you can with all you’ve got to accomplish it! God will provide!